Surgeon Simulator 2013 was recently updated to include Team Fortress 2's Heavy and Medic. On completion of the new level, players were awarded with a small statue. On the base of that statue? 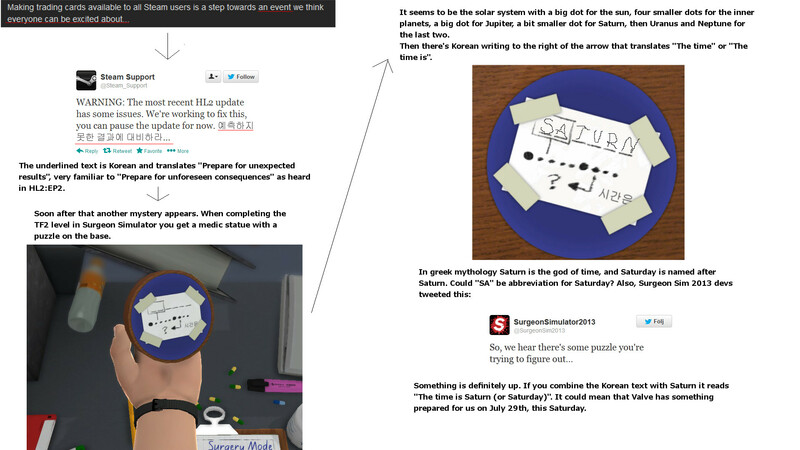 A puzzle and Korean text, leading to speculation that this was the continuation of what was assumed to be a Valve-led ARG. Before we go on, we need to be absolutely clear: whatever's happening, and whatever it relates to, we're still not involved . Here's a better look at the puzzle. It contains a row of dots, space for a six letter word, and, most intriguingly, Korean text. That text, when translated, was close enough to the Episode 2 line "prepare for unforeseen consequences" to get people excited. So much so that Valve later had to clarify, tweeting from the same account, "HL2 and EP1/EP2/Lost Coast are being converted to SteamPipe today. This isn't an ARG, just STEAMPIPE." But a follow up this morning throws cold water over the idea that its related to one of Valve's games - including that one. To recap: Yes, there is a puzzle. No, it's not Half-Life 3. The solution to the puzzle? Here's one of the better explanations , posted on NeoGAF . It posits that the dots relate to planets, meaning the arrow is pointing from Saturn. Given that the Korean text has something to do with time, it's led people to believe that someone will announce something on Saturday. If it is Valve related, it'll likely to be Summer Sale. Note how the SS2013 tweet mentioned it's not related to "Valve's games", meaning... OH GOD I'M STARTING TO SOUND LIKE THEM. My advice? Enjoy the show. It's great watching the internet collectively sleuth out ARG clues. It's even better to watch the internet speculate wildly.